Nurses at Jane Phillips Medical Center are being honored with The DAISY Award for Extraordinary Nurses. The award is part of the DAISY Foundation's program to recognize the super-human efforts nurses perform every day. DAISY Award recipients are registered nurses who exemplify the nursing values: extraordinary compassion, courage and integrity, in every situation. These individuals consistently demonstrate excellence in the delivery of patient care and promotion of their professional nursing practice. The DAISY Award is an international program that rewards and celebrates the extraordinary clinical skill and compassionate care given by nurses every day. Jane Phillips Medical Center is proud to be a DAISY Award Hospital partner, recognizing one of our nurses with this special honor every month. The not-for-profit DAISY Foundation was established by family members in memory of J. Patrick Barnes. Patrick died at age 33 in late 1999 from complications of idiopathic thrombocytopenic purpura (ITP), a little known but not uncommon auto-immune disease. The care Patrick and his family received from nurses while he was ill inspired this unique means of thanking nurses for making a profound difference in the lives of their patients and patient families. Registered nurses may be nominated by patients, families, and colleagues, and are chosen by a committee at Jane Phillips Medical Center to receive the DAISY Award. Awards are presented monthly at presentations given in front of the nurse’s colleagues, physicians, patients, and visitors and members of the leadership team. Each honoree receives a certificate commending her or him for being an "Extraordinary Nurse." The honoree is also given a beautiful and meaningful sculpture called A Healer’s Touch, hand-carved by artists of the Shona tribe in Africa. 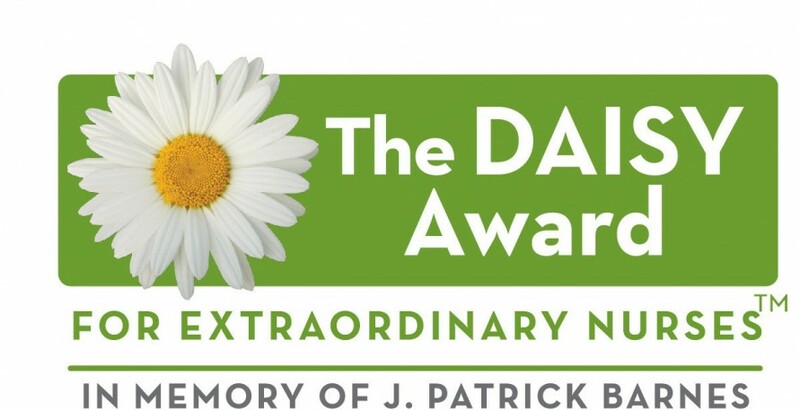 To nominate a nurse at Jane Phillips for the DAISY Award, click here to download a nomination brochure or call the Jane Phillips Patient Relations office at 918-331-1462 .